What’s Hijacking News; How Does Small Business Benefit? David Meerman Scott’s book “Newsjacking” made the term more popular. It is worth noting that “newsjacking” and “hijacking the news” are used interchangeably but they both mean the same thing. Public relations people have been doing this same sort of thing for some time, linking events, openings, and soft news announcements to bigger news or events of the day. Newsjacking is the natural evolution of public relations for the Twitter/Instagram era. The man who claims to have invented and coined the term “public relations”, Edward Bernays, was once hired to promote cigarette smoking. An activity unthinkable today, this happened just before the great depression. Bernays wanted to short circuit traditional channels of communications that he knew would never carry any message encouraging women to smoke. He knew that smoking among women was discouraged and not thought of as “lady like” and that the editors and reporters he typically counted on for covering his clients would not help him. He knew also that women represented a great and un-tapped market for cigarette makers to recruit. What to do? During the traditional Easter Parade in New York City, Bernays hired women to march in the parade who were all wearing traditional Easter bonnets and springtime fashion. They were also all puffing away at cigarettes provided to them by Bernays. To lend legitimacy to the public display, he framed the issue around women’s’ rights and dubbed their smokes “torches of freedom” and the rest is history. Some find this a clever way to leverage a traditional event and others found it a cynical ploy. But either way it worked. Traditional public relations does not have to be so earth shattering as persuading millions of women to start smoking. There are plenty of less controversial examples. If you want to introduce a new type of ice cream, do it on “National Ice Cream Day” which is Sunday, July 19, 2015. If you are in the hot dog or picnic business, launch a new product on July 4 or Labor Day. It’s natural to link hot dogs with July 4 (pun intended). Newsjacking takes this concept and expands it, giving content marketers the chance to turn the days events and the spotlight of positive attention on to them, even if only for a short time. Of course there is room for traditional public relations campaigns and no one should think that newsjacking is a substitute for it. What newsjacking does is augment what your ongoing public relations work does, but with content relevant to current events. Newsjacking can have an immediate impact. When I worked for large and well-known companies I knew that their respective logos on my business card was enough to get me into print or at least get a phone call returned. I had the advantage of their brand identity passed to me via the work and positive heritage those places already had, well before I ever showed up. But for start ups, hijacking a news story creates a level playing field that in the age of Twitter and Instagram allows anyone to inject him or herself into the public eye. Newsjacking can make big company attention available for those who do not have massive resources or well-established identities. The same playing field is particularly level for people who are constant observers of the news in their respective industries, locale, nationally or globally, are quick to act and are reasonably good communicators. Marketers should try to hijack the news for lots of reasons. The main and only important reason is to draw positive attention to you and what you have to offer. There are other benefits. Newsjacking can also help boost SEO and position you as a thought leader in your field, which is one of the top objectives of many campaigns. Newsjacking helps blog content and social posts to instantly reach interested followers and attract new ones. Effectively, this means newsjacking can have an immediate impact on you and your brand. Your start up can become part of a trend, drive traffic to their site and get ahead of events even as they are happening. Hijacking the news means aligning your expertise with breaking news. What Does A Newsjacked Story Look Like? What does hijacking the news or “newsjacking” look like? 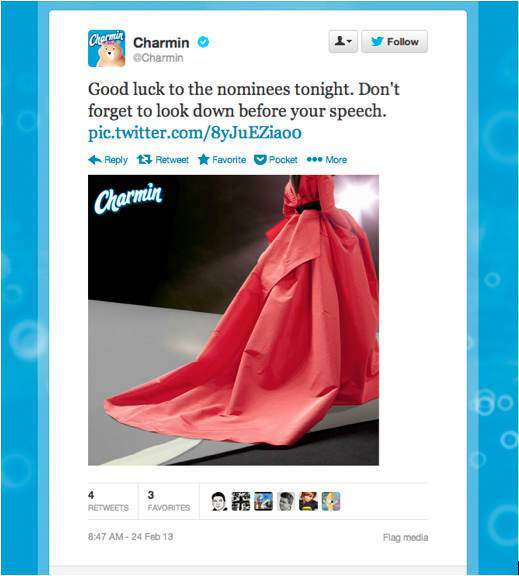 Charmin toilet paper got positive attention with bathroom humor during the 2013 Oscars with this tweet. Obviously the Charmin people planned to do this well in advance, evidenced by their staged photo. But they hijacked the event nonetheless. 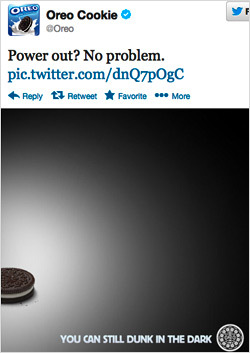 To see an example of more spontaneous newsjacking, turn to Oreo Cookies clever tweet which came during the 2013 Super Bowl, when the lights went out. Valuable? Well neither Oreo or Charmin paid to advertise during either event which saved each company millions of dollars. And their humorous and spontaneous messages resonated because they were not well-orchestrated corporate blather, but felt real, sincere and credible. Knowing that breaking news adds a different element to newsjacking, stay tuned to news and popular culture. If you want to leverage the news, you will need to be plugged in. Choose a handful of news outlets to watch, listen to, or read. Be certain of the credentials and bona fides of those outlets you choose. The Onion or Fark are not good sources. Pick some outlets that are strictly for business some for general news and others for local news. Since most of your business will come from geographically close businesses and people, it is really important to know “what’s what” in your area. Newsjacking local stories is probably a better alternative for local businesses. Be ready to act quickly. To get the most exposure be ready to move. And remember that you are not the only one out there who is looking to enhance their reputation by linking themselves to a news angle. Make a list of things and events that are relevant to you and that will attract the right people to your site. Brainstorm some possible opportunities and how you might leverage them. Make obvious connections, never strain to stretch an analogy or make a false comparison. Like linking measles to governance would be a mistake: “XYZ’s spotty record on corporate governance not part of measles concerns.” Funny, but probably not appropriate. Plan in advance. What are things we know that are coming up that might be commented on? Quarterly earnings reports, court appearances, and speeches from people you know are going to make the news are part of that planning. Get pre-approval ahead of time to create content in real time. Start with steps 1-4. Once you have those handled, move to 5 and 6. Since you are new to this I would consult with me, or someone else who is qualified to judge on the connection. There are plenty of potential problems with newsjacking that can have the opposite impact wanted.